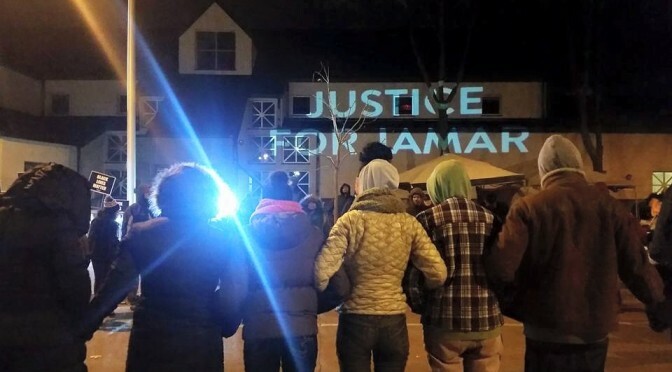 We urge all supporters of 15 Now Minnesota to fight for #Justice4Jamar by joining the 4th precinct occupation, donating to the legal fund, or writing a letter to the editor. Statement written by 15 Now MN steering committee, photo via Black Lives Matter Minneapolis. The whole world is watching the latest battleground in the movement for black lives. For several days, large crowds have gathered to demand #Justice4Jamar. Jamar Clark died of a gunshot wound to the head inflicted by a police officer last week. Multiple witnesses say he was shot while handcuffed, “execution style.” Many 15 Now volunteers are participating in the peaceful protest and occupation at the front entry of the 4th precinct police station in Minneapolis.